Contact us for more information on Frank's PMP. Frank’s Preventative Maintenance Program (PMP) is designed for clients who care about the long-term health of their cars. What is Frank’s PMP and how does it work? 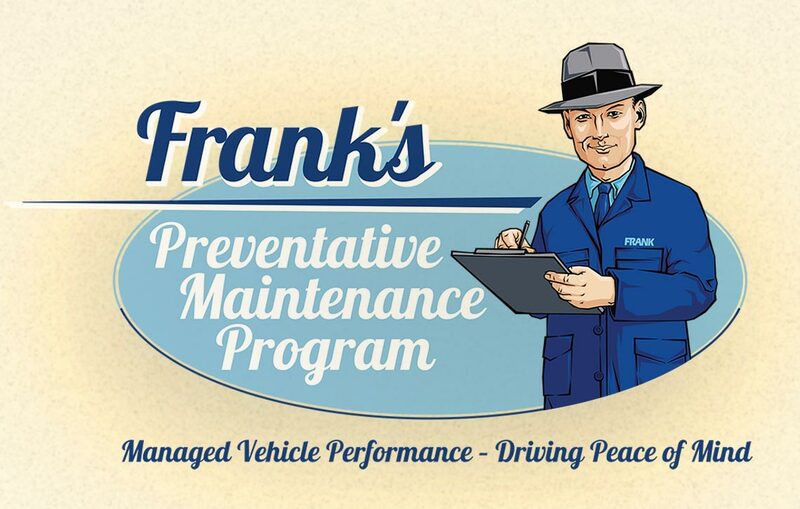 Frank’s PMP is a personalized approach to managing your car’s maintenance needs. You gain peace of mind; you ensure your vehicle's proper performance; you save money. With Frank’s PMP, small issues can be diagnosed and fixed before they become real problems. Your Frank’s PMP experience starts with a consultation to learn more about you and your car so we can create a unique plan for servicing your vehicle including: scheduled inspections, customized appointments, and convenient re-scheduling options – all based on your make and model; your preferences; your schedule. There is no cost to become a Frank's PMP member, actually it is what will you save you money; all we require is your commitment to the program. With a well-managed approach to maintaining your vehicle, you will dramatically reduce your risk of a surprise breakdown that can ruin a vacation, disrupt your work week, or take time away from your family. If you’re a Frank Motors client and a Frank’s PMP member, you can rest assured that your car is in the hands of Winnipeg’s finest technicians – technicians who know your car and know what it needs today and what it will need tomorrow. To say thank you for your business and to brighten your day, we will clean your car – inside and out – before we give it back. Our exterior wash and light vacuum is performed with the care you and your car deserve. So, you’ve decided it’s time to buy a new car. But it seems there are 85 different car manufacturers, each with 23 models – and things keep changing all the time! Where do you start? Because you’re a Frank’s PMP member, Frank Motors can take our extensive knowledge of your preferences and your driving habits and find the right new or used car to suit your tastes, needs, and budget. We’ll take the stress out of buying a new car, and save you a few dollars in the process. Let us do the homework for you, and make your decision an easy one. I come to Franks Motors every year to get my car sprayed with Krown Rust Protection. Every year they have great service, people who are friendly and always willing to help and they really care about the service they provide. I bring my car back every year.